"Poughkeepsie" redirects here. For the town surrounding this city, see Poughkeepsie (town), New York. For other uses, see Poughkeepsie (disambiguation). Poughkeepsie (/pəˈkɪpsi/ pə-KIP-see), officially the City of Poughkeepsie, is a city in the state of New York, United States, which is the county seat of Dutchess County. As of the 2010 census it had a population of 32,736. Poughkeepsie is in the Hudson Valley midway between New York City and Albany, and is part of the New York metropolitan area. The name derives from a word in the Wappinger language, roughly U-puku-ipi-sing, meaning "the reed-covered lodge by the little-water place", referring to a spring or stream feeding into the Hudson River south of the present downtown area. Etymology: U-puku-ipi-sing: "The reed-covered lodge by the little-water place"
Poughkeepsie is known[by whom?] as "The Queen City of the Hudson". It was settled in the 17th century by the Dutch and became New York's second capital shortly after the American Revolution. It was chartered as a city in 1854. Major bridges in the city include the Walkway over the Hudson, a former railroad bridge (originally called the Poughkeepsie Bridge), which re-opened as a public walkway on October 3, 2009; and the Mid-Hudson Bridge, a major thoroughfare built in 1930 that carries U.S. Route 44 (concurrent with State Route 55) over the Hudson. The city of Poughkeepsie lies in New York's 18th congressional district. The site of Poughkeepsie was purchased from the Indians in 1686 by Robert Sanders, an Englishman, and Myndert Harmense Van Den Bogaerdt, a New Netherland-born Dutchman. The first settlers were the families of Barent Baltus Van Kleeck and Hendrick Jans van Oosterom. The settlement grew quickly, and the Reformed Church of Poughkeepsie was established by 1720. The community was set off from the town of Poughkeepsie when it became an incorporated village on 27 March 1799. The city of Poughkeepsie was chartered on 28 March 1854. Outside of municipal designations, the city and town of Poughkeepsie are generally viewed as a single place and are commonly referred to collectively as "Poughkeepsie", with a combined population of approximately 75,000. Early on, Poughkeepsie was a major center for whale rendering, and during the 19th century, the industry flourished through shipping, hatteries, paper mills, and several breweries along the Hudson River, including some owned by Matthew Vassar, founder of Vassar College. Due to the area's natural beauty and proximity to New York City, families such as the Astors, Rogers, and Vanderbilts built palatial weekend homes nearby. The Vanderbilt mansion, located several miles up the Hudson from Poughkeepsie in the town of Hyde Park, is registered as a National Historic Site; it is considered to be a sterling example of the mansions built by American industrialists during the late 19th century. The city is home to the oldest continuously operating entertainment venue in the state, the Bardavon 1869 Opera House (see below). The city is located on the western edge of Dutchess County, bordered by Lloyd across the Hudson River to the west and by the town of Poughkeepsie on the north, east and south. 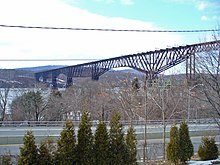 There are two crossings of the Hudson River in Poughkeepsie: the Mid-Hudson Bridge for motor vehicles and pedestrians, and the pedestrian "Walkway over the Hudson". According to the United States Census Bureau, the city has an area of 5.7 square miles (14.8 km2). 5.1 square miles (13.3 km2) of it is land, and 0.23 square miles (0.6 km2) of it (10.05%) is water. It is about 75 miles (121 km) north of New York City and is in southeastern New York State. Poughkeepsie has a humid continental climate (Köppen Dfa) with relatively hot summers and cold winters. It receives approximately 44.12 inches (1,121 mm) of precipitation per year, much of which is delivered in the late spring and early summer. Due to its inland location, Poughkeepsie can be very cold during the winter, with temperatures dropping below zero a few times per year. Poughkeepsie can also be hit by powerful nor'easters, but it usually receives significantly less snow or rain from these storms compared to locations towards the south and east. The Poughkeepsie City School District is the public K-12 school system serving approximately 5,000 students. The Culinary Institute of America's main campus is located the suburb of Hyde Park, north of the City of Poughkeepsie. Dutchess Community College, Marist College, and Vassar College are all located in the surrounding town of Poughkeepsie. 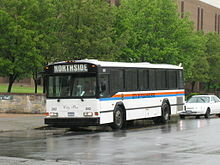 Rail commuter service to New York City is provided at the Poughkeepsie Metro-North station by the MTA's Metro-North Railroad. Poughkeepsie is the northern terminus of Metro-North's Hudson Line. Amtrak also serves the station, along the Hudson River south to New York City's Pennsylvania Station and north along the river to Albany-Rensselaer station and points further north and west. Amtrak trains serving Poughkeepsie are the Adirondack, Empire Service, Ethan Allen Express, Maple Leaf, and Lake Shore Limited. The Dutchess County Airport in nearby Wappinger services general aviation, although it once had scheduled air carrier service by Colonial Airlines in the 1950s and regional airline service by Command Airways and others in the 1960s–1980s. The nearest major airport to Poughkeepsie is Stewart International Airport about 25 miles (40 km) south in Newburgh. Other nearby airports include Albany International Airport approximately 85 miles (137 km) north and the three major metropolitan airports for New York City: John F. Kennedy International Airport approximately 88 miles (142 km) south, Newark Liberty International Airport approximately 88 miles (142 km) south, and LaGuardia Airport approximately 80 miles (130 km) south. Bus transit service is provided by Dutchess County Public Transit, operated by Dutchess County, which travels throughout Dutchess County and also serves as the main link to the Route 9 corridor including Poughkeepsie Galleria and South Hills Mall. Both services have a quasi-hub at the intersection of Main and Market streets, adjacent to the Mid-Hudson Civic Center and at the west end of the former pedestrian-only Main Mall (the mall was removed in 2001, with those blocks being restored back to traffic and to the name Main Street). Other buses serving this area include Adirondack Trailways, Short Line, commuter runs to White Plains, and a shuttle to New Paltz. The city is protected by the career firefighters in the City of Poughkeepsie Fire Department. By keeping buildings up to code, controlling illegal occupancies, monitoring the safety of living areas and issuing licenses and permits, the department works to limit the potential for dangerous situations and the occurrences of fire hazards. The PFD operates out of three fire stations, located throughout the city, and operates and maintains a fire apparatus fleet of four engines, including one reserve engine; two trucks; one rescue vehicle, cross-staffed as needed; and one fireboat. The Arlington Fire District, Fairview Fire District, and New Hamburg Fire Department cover the surrounding town of Poughkeepsie. The PFD is capable of handling fires, rescues, extractions and natural disasters. The PFD is a certified EMS first responder fire department and first respond to EMS calls with Mobile Life Support Services. Police protection to the city is provided by the City of Poughkeepsie Police Department (CPPD). The police department has over 125 employees, including 96 sworn police officers and 34 civilians, of which 13 are emergency dispatchers. The CPPD also operate a Citizen Observer Alert Network to keep citizens informed about local crime, emergency situations, and other important information. The Dutchess County Sheriff Station is based in Poughkeepsie and is adjacent to the Dutchess County Jail, which houses around 275–300 inmates maximum capacity at any time. The City of Poughkeepsie is home to Vassar Brothers Medical Center (VBMC), a 365-bed hospital situated next to U.S. Route 9 on Reade Place. VBMC is home to an advanced birthing center. The hospital also has a Level III Neonatal Intensive Care Unit. Vassar Brother Medical Center is owned and operated by HealthQuest, a local nonprofit collection of hospitals and healthcare providers. Emergency medical services are provided by Mobile Life Support Services (MLSS), who are contracted to provide full-time ambulance coverage to the city of Poughkeepsie. MLSS provides paramedic level service, including Advanced life support (ALS) and has ambulances stationed in the city on Pershing Avenue. MLSS also has a staff of specially trained paramedics that provide tactical EMS support to the city police during ESU/SWAT operations, as well as emergency rehabilitation to city firefighters via their Special Operations Response Team. They also provide ALS ambulance service to multiple other agencies and municipalities in Dutchess, Ulster, and Orange counties, and their headquarters building is located in New Windsor in Orange County. IBM has a large campus in the adjacent town of Poughkeepsie. It was once referred to as IBM's "Main Plant", although much of the workforce has been moved elsewhere in the company (2008). The site once built the IBM 700/7000 series of computers as well as the IBM 7030 Stretch computer and later IBM mainframes. The RS/6000 SP2 family of computers, which came to fame after one of them won a chess match against world chess master Garry Kasparov, were also manufactured by IBM Poughkeepsie. In October 2008, IBM's Poughkeepsie facility was named "Assembly Plant of the Year 2008" by the editors of Assembly Magazine. Poughkeepsie remains IBM's primary design and manufacturing center for its newest mainframes and high-end Power Systems servers, and it is also one of IBM's major software development centers for z/OS and for other products. The Poughkeepsie Journal is the third-oldest active newspaper in the United States, and has offices on Market Street in the City of Poughkeepsie. The Hudson Valley Renegades are a minor league baseball team affiliated with the Tampa Bay Rays. The team is a member of the New York–Penn League, and play at Dutchess Stadium in the nearby town of Fishkill. The Hudson Valley Hawks were a team in the National Professional Basketball League until 2009 when the league disbanded. The team's home court was at Beacon High School, located approximately 16 miles south in the city of Beacon. Poughkeepsie hosted a founding member of the North Eastern Hockey League (NEHL) with the formation of the Poughkeepsie Panthers in 2003. However, due to financial problems, the team only played for one season, and became the Connecticut Cougars the following year. The NEHL folded due financial problems in January 2008. Subsequently, the city was home to the Hudson Valley Bears, one of four founding members of the Eastern Professional Hockey League (EPHL), for one season. Both teams played their home games at the McCann Ice Arena in the Mid-Hudson Civic Center. One of Poughkeepsie's most notable sports events was the annual Poughkeepsie Regatta of the Intercollegiate Rowing Association (IRA), which was held on the Hudson River from 1895 to 1949. The top college teams would attend along with tens of thousands of spectators. Poughkeepsie was known as the rowing capital of the world. Spectators watched from the hills and bluffs overlooking the river and from chartered boats and trains that followed the races along the entire length of the course; which were longer than present-day races, with varsity eights rowing a 4-mile (6.4 km) race. When the IRA moved the regatta to other venues, the Mid-Hudson Rowing Association was formed to preserve rowing in the area. It successfully lobbied to preserve the regatta's facilities for use by area high schools and club rowing programs. As part of the 400th anniversary celebration of Henry Hudson's trip up the Hudson River a recreation of the regatta was held with Marist College Crew as its host. The events included a fireworks display, a large dinner, and the unveiling of the restored historic Cornell Boathouse, now property of Marist Crew. Historically accurate, the four mile long course started off Rogers Point in Hyde Park and ended about a mile south of the Poughkeepsie-Highland Railroad Bridge. Competitors included Marist, Vassar, Army, Penn, Navy, Syracuse, Columbia and Cornell. Notably this was the first time women's crew teams were allowed to participate in the historic IRA Poughkeepsie Regatta. Poughkeepsie has a number of notable institutions for arts and entertainment. The Bardavon 1869 Opera House, located on Market Street just below Main Street, is a theater which has an array of music, drama, dance and film events and is the home of the Hudson Valley Philharmonic. The Mid-Hudson Civic Center, located down the street from the Bardavon 1869 Opera House, hosts concerts, professional wrestling and trade shows and has an ice rink next door for ice hockey. From July 1984 to August 5, 1986, the Civic Center was the location for filming WWF Championship Wrestling. The collections of the Frances Lehman Loeb Art Center at Vassar College chart the history of art from antiquity to the present and comprise over 21,000 works, including paintings, sculptures, prints and photographs. The Barrett Art Center at 55 Noxon Street offers exhibits, classes, and lectures on the visual arts. Locust Grove, the home of Samuel Morse and a National Historic Landmark. It features paintings by Morse, as well as historically important examples of telegraph technology. For shopping and movie theater entertainment, the Poughkeepsie Galleria is located in the town of Poughkeepsie, southeast of the hamlet of Crown Heights and north of Wappingers Falls. The mall, which opened in 1987, consists of two floors with 250 shops and restaurants. The Regal Cinemas theater has 16 screens. Current anchor stores within the mall include Macy's, J. C. Penney, Target, Best Buy, H&M, and Sears. The Mid-Hudson Children's Museum is located at 75 North Water Street. The Cunneen-Hackett Arts Center at 9 and 12 Vassar Street provides venues for music, dance and the visual arts. Joseph Bertolozzi's Bridge Music is a sound-art installation on the Mid-Hudson Bridge. The Chance Theater and Mid-Hudson Civic Center ranked #4 and 5, respectively, on a list of Poughkeepsie's most Instagrammed locations in 2016. The Poughkeepsie Public Library has a central branch on Market Street, and a branch location on Boardman Road. Andrew Jackson Davis (1826–1920), known variously as the "Poughkeepsie Seer" or "The Seer of Poughkeepsie"
^ Buff, Sheila (April 1, 2009). Insider's guide to the Hudson River Valley. Morris Book Publishing, LLC. p. 6. ISBN 978-0762744381. ^ Adams, Arthur G. (1996). The Hudson River Guidebook (2nd ed.). New York: Fordham University Press. ISBN 0-8232-1679-9. LCCN 96-1894. ^ a b "Geographic Identifiers: 2010 Demographic Profile Data (G001): Poughkeepsie city, New York". U.S. Census Bureau, American Factfinder. Retrieved November 13, 2015. ^ Paul Joffe (2008). "Where'e Poughkeepsie? Finding The Lost Spring" (PDF). ^ "Poughkeepsie". Encyclopædia Britannica Online. Encyclopædia Britannica Inc. 2012. ^ a b "Gazetteer of New York, 1860 & 1861, page 274". gedcomindex.com. ^ "NowData - NOAA Online Weather Dat". National Oceanic and Atmospheric Administration. Retrieved 2018-03-07. ^ "Station Name: NY POUGHKEEPSIE DUTCHESS CO AP". National Oceanic and Atmospheric Administration. Retrieved 2018-03-07. ^ "Technical Schools in Poughkeepsie, NY - Ridley-Lowell". www.ridley.edu. ^ "Police Department". cityofpoughkeepsie.com. Retrieved 2017-01-23. ^ "Vassar Brothers Medical Center | Hospital Information". www.healthquest.org. Retrieved 2017-01-23. ^ "About Us | About Us". www.healthquest.org. Retrieved 2017-01-23. ^ "Upstate New York events celebrate 400th anniversary of Henry Hudson's voyage up the river". NY Daily News. 2009-04-21. ^ "Regatta Evokes Poughkeepsie's Rowing Heyday". The New York Times. 2009-04-10. ^ "Poughkeepsie's 15 Most Instagrammed Places - Kingston Creative". Kingston Creative. 2016-06-14. Retrieved 2016-06-18. Mano, Jo Margert and Linda Greenow. 2006. "Mexico comes to Main Street: Mexican immigration and urban revitalization in Poughkeepsie, NY". Middle States Geographer 39: 76–83. Wikimedia Commons has media related to Poughkeepsie, New York. "Poughkeepsie, N. Y." . The New Student's Reference Work . 1914.